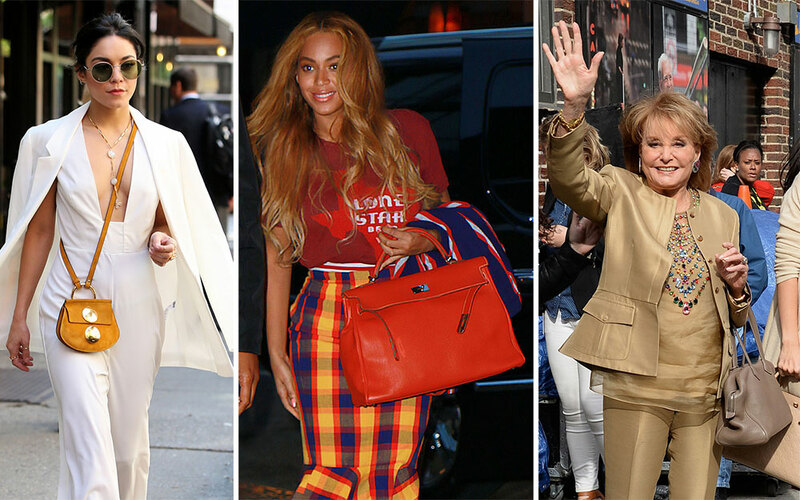 Every few weeks, the celeb bag trend cycle resets itself, and everyone starts falling back on classic handbags from Hermès, Prada and the like. The hot new bags are still represented here (hello, Chloé Faye! ), as are some increasingly popular designer clutch picks for the red carpet, but the big name brands definitely have the majority in this week's first celebrity bag roundup. Here's Barbara Walters, heading in to tape her appearance on Dave Letterman's final show with a nice taupe Hermès Victoria on her arm. Barbara has been leaning pretty heavily on this satchel as of late; here she is carrying the same bag back in April. 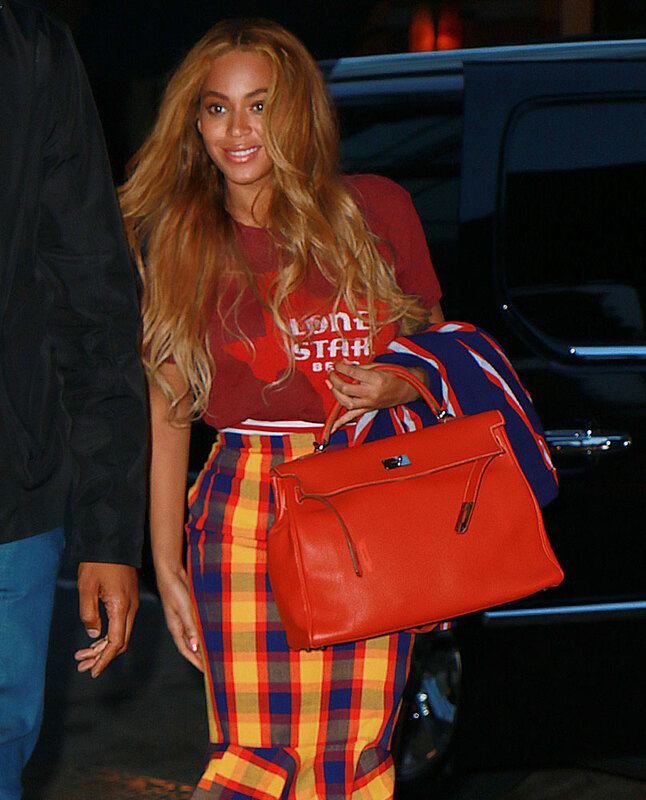 Beyoncé was also recently spotted "out and about" in NYC with a little Hermès of her own. Will this be the first and only time you see a red Lone Star Beer graphic tee paired with a bright red multi-thousand dollar handbag from Hermès? Probably. Supermodel/actress Carol Alt recently paid a visit to the Good Day New York studios to discuss her new book, A Healthy You. Here she is leaving the building with a canvas logo Prada tote in tow. Here's Keyshia Cole sweeping through LAX with a camo-patterned denim Louis Vuitton bag. To be perfectly honest, I had completely forgotten that camo Louis Vuitton bags ever existed. This little Bottega Veneta Knot Clutch has gained some serious traction in recent weeks. Here's Kris Jenner, carrying one as she leaves dinner at Craig's with her boyfriend. Last week, we saw Lisa Marie Presley with one at the premiere of Mad Max: Fury Road. 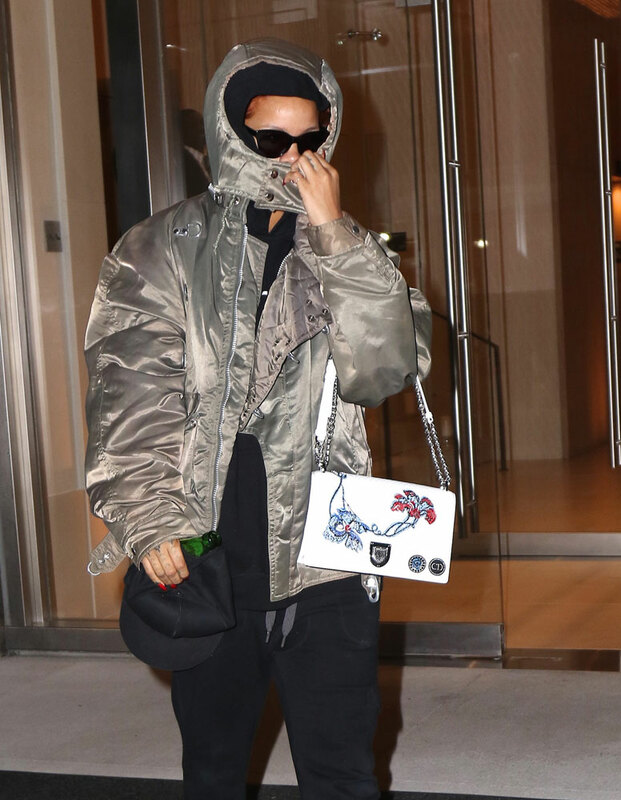 Here's a carefully disguised Rihanna, leaving a midtown hotel with a new Diorama bag after an early morning visit from her hair stylist. If you haven't seen the images from Rihanna's first Dior campaign, what exactly are you waiting for? Vanessa Hudgens has been camped out in NYC for months, and I really think it's doing wonders for her personal style. Here she is heading to her evening performance of "Gigi: The Musical" on Broadway with a mini Chloé Faye.